Nowadays, VR technology has changed the world completely. There are many VR devices in the market, such as Google Cardboard, Samsung Gear VR, HTC Vive, Oculus Rift, Microsoft Hololens and so on. we have introduced them before, details please proceed to the article "VR Vs Augmented - Which is Your Favorite?". Here, we will focus on the app for Oculus Rift only. 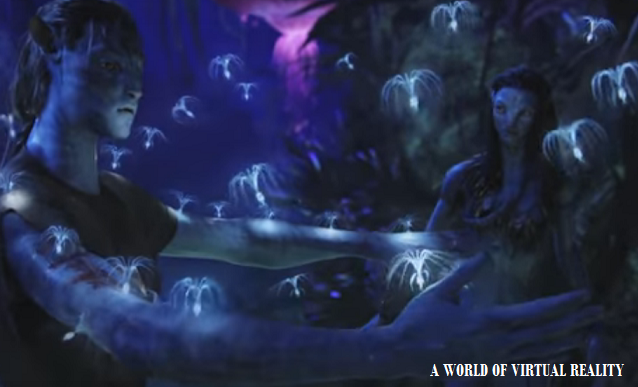 Since 2014, Facebook has taken over the Oculus VR with great plans for future. It released more apps and attracted more people. Unfortunately, Oculus Rift itself does not has a backup app for backing up its games and data. That’s why vrBackupper was born. Although it is a third-party backup tool for Oculus Rift, it can backup data of Oculus very well, we tried and tested so that we recommend it to you. What’s more, vrBackupper has migration function to transfer Oculus data from original place to another. At first, vrBackupper is a freeware, no ad, no need to pay. vrBackupper is a Windows software, you should install it on Windows to use it. At last, vrBackupper is the first such app for backing up Oculus data. There has not a second one or alternative in the market so far. That is to say, vrBackupper is the only choice to backup Oculus. Next, let’s have a look at it and learn how to use. Download, install and run, you can see its main interface as following picture shows. 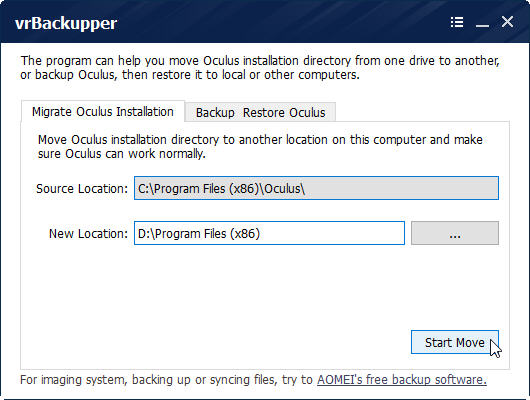 The default option is not backup restore Oculus but migrates Oculus installation. vrBackupper will detect the source location automatically, you just need to browse new location and click start move button. This feature makes up Oculus’ limitation - VR games can only be stored in the installation directory and Oculus old versions can only be installed on the system partition. Once migrated, you solved the problem of lacking disk volume to install games. Non-C: drive can be external drives as well. vrBackupper ensures Oculus’ normal work after moving. Then let’s switch to backup restore Oculus option. Backup has two selections: Backup whole Oculus installation directory and backup only games and apps in Oculus installation directory. Operations are similar to migration. As Oculus users know, re-downloading and re-installing Oculus apps spend time because of low download speed. If you choose backup&restore, you can save time and re-enjoy Oculus quickly. 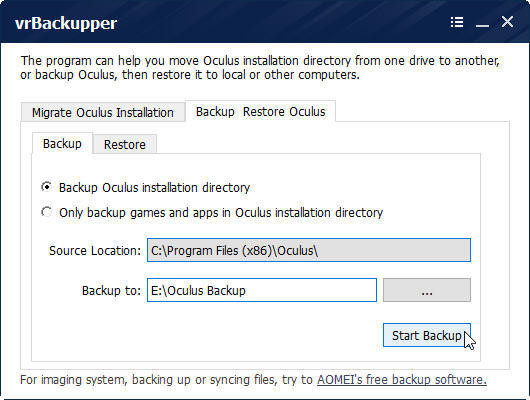 Thanks to AOMEI universal restore technique (Windows backup software - AOMEI Backupper has matured this technology), vrBackupper can help you restore Oculus data to another computer, it ensures you can normally play VR game after restoration. vrBackupper does a great favor for Oculus Rift users. vrBackupper is designed to backup VR game configurations thus you can experience Oculus games better. vrBackupper also avoids low disk space problem when using Oculus Rift. If you think it is useful, please download and try as soon as possible.